You are here: Home / Crafts / It’s a New Year! I guess the first thing I need to do is apologize for not posting more regularly the past several (as in maybe 6 or so) months. I was out of town for quite a bit of the second half of 2012, helping with my new grandson (oh what a joy!) and then visiting and helping with my 2 step grandchildren (who are older but every bit as much fun). Then I went and spent some time with my Dad in New Mexico after a few days (not long enough) with my brother and his family. When I finally got home for good it seems like it was time to prepare for a Thanksgiving visit by my new grandson (he brought his parents along too) and then it was time to get ready for Christmas. Of course I could have blogged in the meantime but somehow I just got out of the habit –for some reason good habits break far more easily than bad ones. But, my only New Years Resolution is to get back in the saddle and start blogging again. I really HAVE missed it. It’s not that I haven’t crafted or cooked at all, it’s just that I haven’t done all of the work involved in getting things onto the blog, that is photos and writing. Now, for today, I will share some of the few Christmas cards I made this year. Like last year I made them, but I didn’t send out nearly as many. I got such a late start I used more stickers and stamps than I did before, but I discovered that there are so many beautiful choices that I still liked the way they came out. You can be really creative and still add your own touches. And because I was so late getting started most of the items were already on sale! If you see something you like and have any questions about how I did it, please ask, I will be glad to share. I’m not going to blog any instructions since they weren’t all that special. For almost all of them I used prefolded card stock that I already had and sticky dots for most of the gluing (to make things go faster). I wanted them to go out before Valentines Day! Now, I’m going to go over to Handmade Harbour and see what everyone else is up to. I’ve been away so long, I hope they remember me! You should go too, I know everyone has been busy. I really need to check back and see what they were busy with for the holidays, I can’t believe I missed all of that! See you soon. I want to share the Moose Blanket I made for my nephew! What beautiful cards! 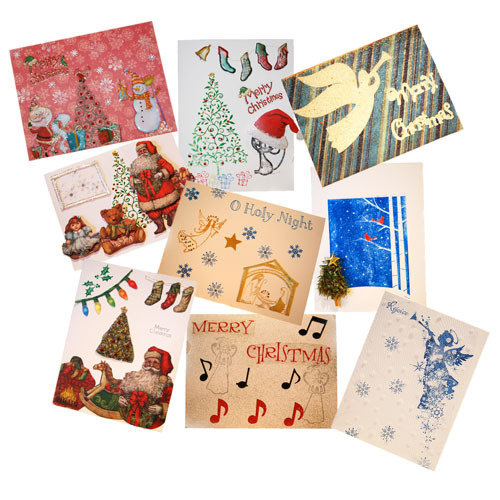 I especially love the blue angel one, its so delicate and pretty, did you use stamps for it? Thank you, and I’m happy to be back, I really have missed it (and everyone!). The blue angel is a stamp (one of those new clear ones, I forget what you call them, but they are are really cool and fun to use). She had snowflakes on her and then I added more snowflakes from another stamp and the word Rejoice was from another stamp (I actually cut it off from a stamp because it had something else that I didn’t like underneath –I think a shining sun and it just didn’t work at all with Christmas for me). What you CAN’T see in the photo is that I glued (with dots) a piece of dotted lace (not sure of the real term) over it. I think that made the card. I love Christmas cards and yours are beautiful !! It’s so fab to receive a handmade card ! Big kisses my friend ! Thank you! You are such a faithful follower of my blog I feel bad that I have not been here! 🙂 Yes, it is nice to get handmade ones. One of my old school friends who is now a friend on Face Book sent me a handmade one this year. It was so pretty and so nice. My niece did also, which was extra special because she is in college and I know her time is filled.